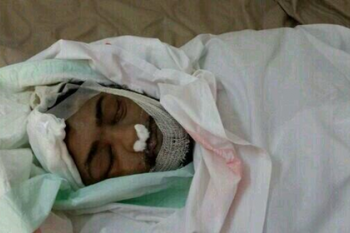 JNN 05 May 2014 Manama : Al Wefaq National Islamic Society demanded the Bahraini authorities to immediately hand in the corpse of the martyr Abdulazziz Alabbar with a death certificate that mentions the real cause of death. The 27-year-old was shot to the head by security forces during a funeral procession in Sar, west of Manama, on 23rd February 2014. That day, the forces fired tear-gas inside a religious place where Quran was being read in the funeral. The interior ministry later admitted the attack. 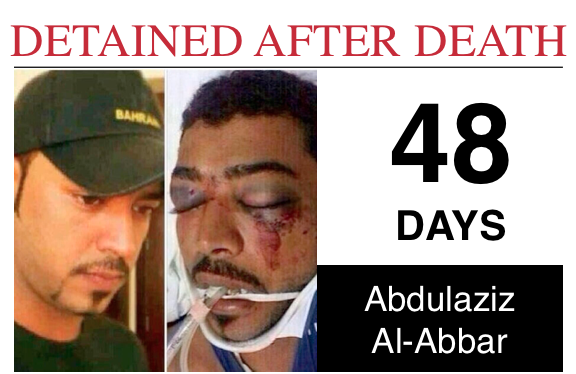 Alabbar died from his injuries on April 18th, 2014. He was in a comma for 55 Days , he embraced Martyrdom on 18 April . Al Abbar was shot directly in the head by the security forces and suffered critical Brain Injuries . The Death Certificate issued by the Bahraini Ministry of Interior stated that the cause of Death was internal Bleeding in the Brain but failed to mention the reason of the Injury . The family is refusing to sign the death certificate until the full cause of death in mentioned . The authorities are therefore refusing to release his Body. Al Wefaq stressed that keeping the martyr’s corpse in detention for 49 days, today, reveals that he was deliberately killed with predetermined intention and within the official systematic killings of dissidents. Most recently, Human Rights Watch issued a report in which it confirmed official immunity to human rights violators in Bahrain. Yet, the Bahraini authorities continue to ignore wide international criticism. Al Wefaq said the denial to the crime proves the existence systematic immunity which all State-institutions are taking part in. These institutions have no justifications for the killing crime, the fabrication of the death certificate, nor the detention of the corpse for all this time, Al Wefaq added. Mr. Christof Heyns, the Special Rapporteur on extrajudicial, summary or arbitrary executions received an urgent complaint letter from 16 human rights organizations on the case of Abdulazziz Alabbar. Abdulazziz’s killer is not the first to escape accountability in Bahrain. Indeed, the security forces and judiciary continue to protect police officers who killed protesters. In the maximum extent, the officers were given extremely light sentences. This entry was posted in Middle East and tagged Abdulazziz Alabbar, al-Wefaq National Islamic Society, Bahraini Martyr, Bahraini Ministry of Interior, Corpse Detained, death certificate, security forces, Shia Man's Corpse. Bookmark the permalink.